The DINAMAP ProCare 300 monitor enhances productivity with easy to use features and an intuitive menu structure. With a properly-sized BP cuff in place, just press a button to take a BP reading. It's that easy. 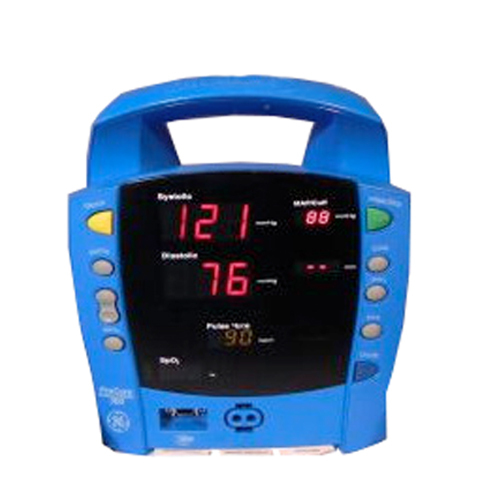 All DINAMAP ProCare Monitors are fully upgradeable so they can grow with your changing needs. With GE Healthcare you get more than a monitor. You get a strategic partner and a total solution. Protection against electrical shock: Internally powered or Class II when powered from specified external power supply. Fuses: The Monitor contains four fuses. The fuses are auto resettable and mounted within the Monitor. The fuses protect the low voltage DC input, the battery, the remote alarm output, and the +5 V output on the host port connector. Battery: 6 volt, 3.3 amp-hours protected by internal auto resetting fuse and thermal protection. Minimum operation time: 2 hrs (5 min cycle with adult cuff at 25°C, SpO2 active at 60 bpm, Temp in monitor mode, printout of current values every 5 minutes) from full charge.